Dehradun: Uttarakhand forest minister Dinesh Aggarwal today released the logo of the Rajaji Tiger Reserve, the notification for which was issues late Saturday night, making it the second tiger reserve in this small mountain state and the 48th in the country. The first tiger reserve in the state, Corbett Tiger Reserve, is a well known tourist destination for wildlife lovers keen to have a glimpse of the tiger, as it has the maximum density with about 340 felines. Incidentally, the Rajaji National Park, which has now been converted into the Rajaji Tiger Resrve, was made in August 1983 after amalgamation of five forest ranges of Pauri Garhwal, Dehra Dun and Haridwar districts. It had an area of about 820 sq kms, but with three more ranges, Shyampur of Haridwar forest division and Kotdwar and Laldhang ranges of Lansdowne forest division, being added to it the Rajaji Tiger Reserve will have an area of about 1150 sq kms. The Rajaji National Park was known all over for its large number of wild elephant population, but now after being made into a tiger reserve, it will also become known for tigers. As of now, official sources said that there are about 11 tigers in the reserve area, but evidence gathered from camera traps in the region indicate that about 45 felines visit the Rajaji Tiger Reserve from the adjoining forests, which resulted in its formation. 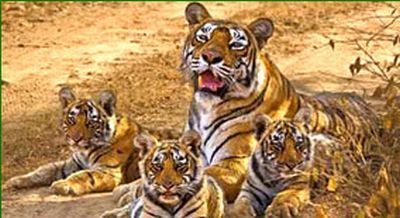 There are hopes that given the large prey base and natural habitat of the new tiger reserve, the feline population will increase and Uttarakhand will become the tiger state of the country. However, for that the forest authorities will have to create forest corridors so that there is a continuous link between the eastern part and the western part, which will facilitate the movement of the tigers in the complete tiger reserve. However, the concerned authorities will have to take note of the large number of Gujjar families that have settled in the Rajaji National Park area for years and are alleged to operate with poachers, as they have complete knowledge of movement of animals in the forest. In fact, some time back there were reports that some Gujjars were allegedly behind the death of a couple of felines, as they anticipated that their cattle were in danger because of the big cats.